What India’s myths tell us about its negotiating tactics. National interest is usually the pivot of a country’s foreign policy. Whether it is maintaining territorial integrity or protecting domestic farmers from seemingly harsh trade agreements, the specific contours of national interest for a particular nation are easily defined and explained. However, exploring the influences on this policy’s expression is a much more daunting exercise. In their book Bargaining with a Rising India: Lessons from the Mahabharata, Amrita Narlikar and Aruna Narlikar take on the task of proving that culture provides one of the many insights into how an India growing in economic heft negotiates internationally. The authors masterfully combine two disparate disciplines, international relations and the study of Indian mythology. They argue that to understand how India positions itself, it is important to understand the cultural moorings from which it engages with the world. This is done by comparing behavioral similarities between characters of the Indian epic the Mahabharata, which is deeply embedded in the Indian consciousness, and India’s negotiating behavior in multilateral forums. The book attempts to show the continuity between India’s cultural past and present, and to gather insights from the former for the latter. It does not seek to prove causal links between the two. Given that the epic does not make for tangible history the way India’s colonial past does, for instance, it is almost impossible to prove such a link between the myth and India’s negotiating reality, a trap the authors do well to avoid. Another trap that the authors sidestep is differentiating between regimes in India. By not doing so, they have inadvertently shown that Indian negotiating behavior is uniform across governments. The Mahabharata is the story of a rivalry between two clans of the same family – the “evil” Kauravas and the “virtuous” Pandavas. It culminates in the 18-day war at Kurukshetra, wherein the wronged Pandavas fight to reclaim their kingdom and emerge victorious. The book explores four aspects of Indian negotiations (strategy, how arguments are framed, how coalitions are built, and whether or not urgency is displayed in reaching agreements) to analyze the broad tendencies of India’s multilateral bargaining behavior. It finds that the country perceives agreements to be a zero-sum game. Therefore, it frequently refuses to concede to altered terms of agreement, even at the cost of not reaching an agreement at all (called a distributive strategy). It usually frames its arguments in moralistic, verbose terms and tends to correlate its interests in loose ideology-based coalitions rather than in issues-based alliances. All of this ultimately leads to a lack of urgency in reaching an endgame for the issue at hand. One of the most telling examples used in the book that explains this behavior is India’s role as a leading member of the G10 coalition of developing countries in the run-up to the Uruguay Round (1986 to 1994) of the General Agreement on Tariffs and Trade (GATT). The G10 vehemently opposed the inclusion of new issues such as Trade Related Investment Measures (TRIMS) and Trade-Related Aspects of Intellectual Property Rights (TRIPS) under the GATT umbrella. Ultimately, the other members of the group agreed to terms that differed from their original stance, which left India isolated (the Uruguay round did end up concluding agreements on intellectual property rights and investment measures). When this is compared to the story of Bhishma in the Mahabharata, significant parallels emerge. Bhishma, an ally of the Pandavas, was the grandsire of the warring clans. His presence in the first 11 days of the war denied the Kauravas another valuable ally, Karna, who refused to fight alongside Bhishma on ideological grounds (a distributive strategy). After he was felled on the 11th day, Bhishma, who had been granted the boon of choosing the time of his death, chose to wait six agonizing months on a bed of arrows for an auspicious time to do so. Even in his agonized state, he found the strength to counsel the victorious Pandavas on the morality of statecraft after the war (moral framing). Though rich in detail and entertaining, the lack of analysis as to whether India’s current strategy has benefited it or not makes it difficult for the reader to judge which behaviors India should modify and which it should retain. The book’s biggest strength, however, is that it offers an entirely new timeframe within which the influences on Indian foreign policy can be viewed. In doing so, the authors have delved into the psyche of Indian negotiators to explore their motivations. Breaking down negotiating behavior into four distinct facets helps the reader to understand the self-image of Indian negotiators as representatives of their nation. This makes for a book that is not only intriguing and enriching, but also complex without being cumbersome. 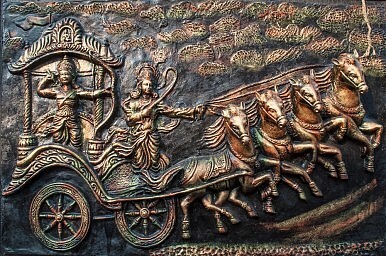 The Mahabharata does not represent all of Indian culture, but it does represent a part of it. The authors have made an important contribution to understanding the role of Indian myth-making in its approach to negotiation. This book is especially relevant now, since although there is a new regime in India that is radically different from its predecessor, its negotiating strategy does not seem to have changed. This was evidenced by India’s recent blocking of the customs deal at the WTO. While the book does not seek to explain Indian behavior in its entirety, it shows one of the many possible prisms through which to view it. The views expressed by the writer are personal.